CBBC star Barney Harwood is to become the 35th presenter of BBC children's magazine programme Blue Peter. Harwood, 31, who has appeared in shows including Bear Behaving Badly and Totally Doctor Who, will take over from Joel Defries, who leaves this week. Harwood said his ambition was always to be a children's TV presenter, and that Blue Peter was the "icing on the cake". Harwood, whose appointment was revealed on Monday's show, joins Helen Skelton and Andy Akinwolere on 17 January. The presenter, from Blackpool, Lancashire, is currently rehearsing for his lead role in Peter Pan in Lichfield, Staffordshire. He said he was looking forward to wearing his Blue Peter badge on screen for the first time and tackling "some exciting challenges". 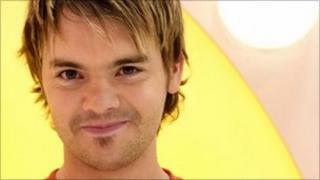 Harwood, who started his career in boy band Goal at the age of 17, won a children's Bafta in 2007 for CBBC show Smile. Blue Peter editor Tim Levell said he was "a versatile presenter with a wealth of passion and experience".